For the last week of term we are doing an ANZAC study called 'Life in the trenches'. To start the day Mrs Hastie kindly brought in some army clothing and equipment to show us. Some of us had a go at wearing the uniform and carrying the heavy pack. Next we looked at the different roles men and women had during the war. Then the boys and girls spilt up and started some hands on activities. The girls went foraging for food in the local orchards and were taught how to sew. 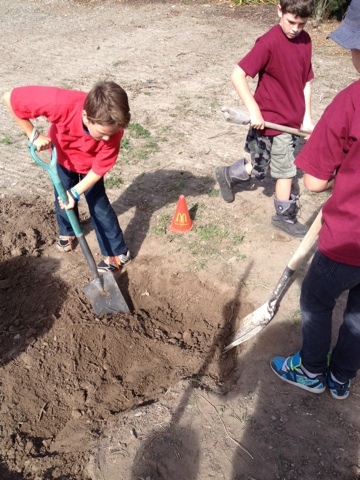 While the boys were sent to the front line to dig trenches and marching drills. Hi,my name is Esther.It must be fun to build trenches. It would be amazing to visit your school. nice job working on the gooooood gaaardening! 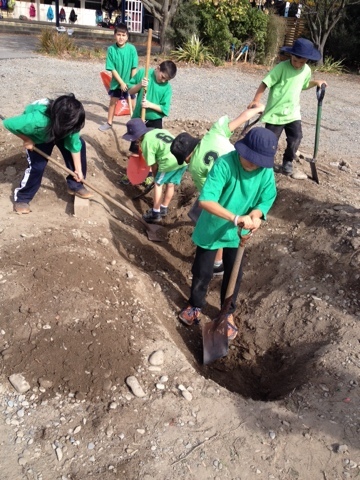 Hello Ako Ngatahi Megan here your trenches look amazing. How long have you been making them? I wish we could make them at my school. They look like the ones from the war.